The world was created in 6 days, and so was modern Israel. This paean to Jewish hardiness, perseverance, cunning and pragmatism is, at the blurb-level, about the shortest war during the Baby Boomer generation. 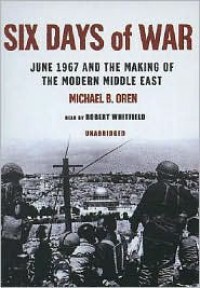 But the heart and motivation of this book, by author Michael Oren, the sitting Israeli ambassador to the United States, is about existential rights; i.e., who is the rightful owner, landlord and tenant of the dry and weary land which holds Jerusalem at its center. This is the tale of a week's worth of confused and bloody war, a war that embodied many other regional and worldwide events leading up to it, and influences Middle East and international geopolitics 46 years later. ... And on the 7th day, instead of resting, this new-but-ancient, small-but-ferocious nation lies uneasy, vigilant against enemies that surround it. One would have to recognize of course that this is written from the point of view of Oren, quoting diplomatic dispatches, eyewitness accounts and historical records for credibility, but a view that is certainly not unbiased, notwithstanding the attempts at fairness. In so many words, he presents Israel's argument as a form of subdermal apologetics. And either you will accept it or reject it, but seldom will the response be blah. Such is the way of the world when it comes to anything Israel. The title war is also called the 3rd Arab-Israeli war, and it behooves the reader to find out about the first two wars (1948-9 and 1956) for context. It would also help to have a detailed map on hand as the war is prosecuted on three different fronts, with references to many place names that may not be commonly known. The impact this book had on me was to spur research (thank you Wikipedia even if people think you are inaccurate!) about Middle East history and events, to understand, from several viewpoints why things are the way they, or at least have a sense of some of the nationalistic and religious motivations. If it does the same to you, then the book has perhaps made its best possible impression. I do not recommend this book if one is looking for military tactics and strategy as the writing is more intellectual and philosophical than nitty-gritty warfare.